It’s time to get in touch with nature with these nature activities! Research shows that young children derive a range of benefits from having access to nature. A young children’s relationship with nature is vital for their overall development, including better concentration, motor co-ordination, co-operative, social play and opportunities to feel connected to the larger universe of living things. Collect pine cones to form pine cone mazes for your child to walk through. Pick flowers, twigs, petals, buds, acorns, small branches, leaves, long grass, bark etc., to create nature people. Take paper and thick crayons for your child to make bark rubbings. Pick flowers, make flower chains, Alice bands, necklaces, blow dandelions, etc. Make leaf rubbings with paper and brightly coloured crayons. Collect small stones to make patterns on the grass. Throw pine cones into a bucket. Create collages with collected leaves. 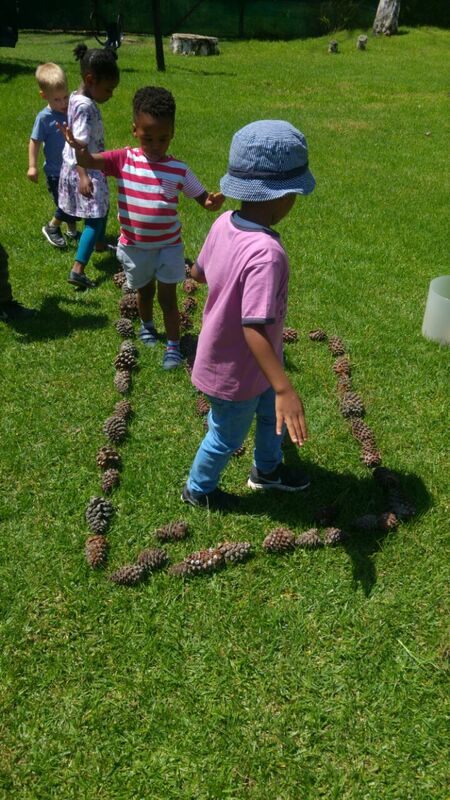 Make basic shapes with pinecones outside. Press leaves or flowers to make book markers. Play the “I spy game” in the garden or park. Pack a bag with binoculars, magnifying glasses, gardening books, a picnic blanket, a picnic basket filled with wholesome goodies, paper, crayons, kites, balls etc. and you even can bring your pets too. Make or erect a tent with logs for sitting, a pile of sticks to make a pretend fire, decorate your place of haven with freshly picked flowers and use your wild imagine! Observe birdlife with binoculars and a bird book. Pack a picnic box with a blanket and enjoy this special time with your child. Talk about what you see in nature, explain, have open end conversations …..
Identify the names of trees and flowers that you see. Enjoy the tranquillity of your outside space. Be aware of the trees swaying, leaves falling, sound of water …..
Take sticks and draw in the sand. Make a mobile with a hanger and string with nature objects such a bark, pebbles, sticks etc. Paint and decorate small pebbles. Explore, observe, discover, marvel, appreciate, create and let your children enjoy the beauty and joy of their outside environment !